Having green or black rings around the yolks of your hard-boiled eggs means that they have been overcooked. Consequently, they not only fail to look good, but they also fail to smell and taste good as well. Luckily, the way to avoid having a black (or green) ring show up around the yolks of your hard-boiled eggs is quite simple, and requires no special equipment. With a little preparation, you will be able to cook perfect hard-boiled eggs in no time. 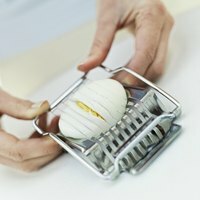 Pull however many eggs you want to hard-boil out of your refrigerator. Let them sit at room temperature for 10 minutes. You can proceed to steps two and three while you are waiting for them to come to room temperature, as they will take some time. Fill your saucepan with enough water to cover the eggs completely when you put them into the pan. Make sure to leave enough room for the eggs, which you’ll be adding later. Place your saucepan on your stove and turn the burner to its highest setting. Bring the water to a rolling boil. Use a large spoon to lower each room-temperature egg gently into the boiling water, one at a time. Do not tip the eggs off the spoon. Instead, gently lower each egg to the bottom of the pan so that it does not crack. Set your timer for 12 minutes if you are cooking four eggs or less. If you are cooking more than four eggs, set your timer for 13 minutes. Keep your burner set to high, as the water needs to return to boiling after you have placed the eggs in it. Maintain the heat high enough that the water continues to boil until the timer goes off. Turn the burner off once the timer sounds. Pull your saucepan off the burner and immediately run it under cold water in your sink. Continue running cold water over the eggs until they are cool enough to touch. At this point, you can easily peel them under the running water, or you can allow them to cool to room temperature before refrigerating them. In either case, when you bite or slice into them, you will see perfect, sunny yellow yolks that are fully cooked. Allowing your eggs to come close to room temperature before boiling lessens the likelihood that the shells will develop stress fractures. Putting eggs into boiling water straight from the refrigerator makes it likely that the shells will crack.